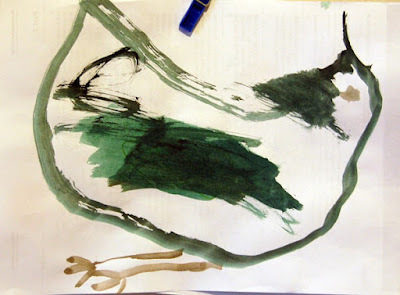 I like the way my son paints and draws. I try to do the same, doodle on a piece of paper like crazy but it just won't go out. It doesn't have the same kick. So instead I finish now what he has started. See the pictures. I added an eye and legs and it is a bird! Face and legs and it is ... an animal. We also have few landscapes with Sun or birds added but these are the least redone. I could do this for a while feeling like I am undergoing some kind of art therapy. magic! and fun to do! what about your son, does he like your finishings? hello! i just discovered your blog through elisabeth dunker. i don't dare to "improve" the drawings of my son. 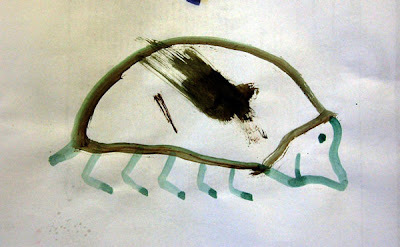 well, he's 4.
i find children are really ingenious artists, the most of them. somehow it gets lost later, unfortunately..
but i can see your point with the "art-therapy" ;) for me it's similar with photography. when i'm feeling stressed and unpatient with my children i say to myself: it's time for one more fotoshooting. love the animal! and i have to tell you a while ago my husband mentioned he loves your bags. . . maybe that means he'll buy one for me! At swim-two-birds, I think my son doesn't care what I do with it. I think he liked the one with the bird, we have it on display. Ieva jansone, nice to meet you, your photographs are interesting I went to have a look. Nice to meet you, too, Annie Koelle, was it your husband who wrote me a message on etsy to tell me that? Cool - I hadn't thought of that I'll need to try it. Collaboration is such a great idea and so tempting when you're an artist. Glad to find your blog!! It seems we have a hobby in common. Lately I have found myself coloring the paintings of my three-year-old. But the pictures of my older one I know to leave alone.